Stock #A108SS:IMMACULATE!!! 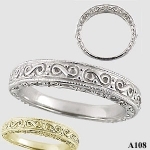 Antique Style Fancy Engraved Wedding Bands.....4 1/2 mm wide!!! .925 Sterling Silver Gorgeous hand-made piece!!! Fits best with styles A104, A111, A110, A105, A111P, A404, A405. Beautiful, Heavy, Hand-Crafted, top quality Jewelry workmanship!!! New style!!! Also Available in 14k yellow gold, 14k white gold, 14k rose gold, and Platinum. Mens version also available (M208). This item is sold out / discontinued.